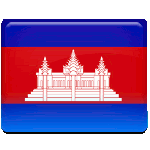 The King's birthday is one of the national holidays in Cambodia. The reigning King of Cambodia Norodom Shiamoni was born on May 14, 1953. The festivities last for three days, from May 13 to May 15. Shiamoni was born in 1953 to King Norodom Sihanouk and his second legal wife Paul-Monique Izzi (Norodom Monineath Sihanouk). He spend most of his life outside Cambodia, namely in Czechoslovakia, North Korea, and France. Shiamoni lived in France for nearly two decades, teaching ballet. In 1993, he was appointed as Cambodia's ambassador to UNESCO. He was previously offered an appointment as the country's ambassador to France, but refused it. In 2004, King Norodom Sihanouk unexpectedly abdicated from the throne and moved out of the country. A special nine-member throne council appointed Shiamoni as the new king. His inauguration took place on October 29, 2004. The King's birthday is observed as a public holiday. On the occasion, many government buildings are decorated with the King's portraits and national flags. The festivities last for three days. During these period, Cambodians often hold parties or attend those of their family and friends. On the evening of May 14, an impressive fireworks display takes place in front of the Royal Palace in Phnom Penh, the national capital of Cambodia.